The ideal desktop organizer manages lighter workflow. Great for organizing mail, forms, catalog sheets or any letter size literature. Stylish decorative solid color blends with any d cor. Includes plastic channels and labels to create a desktop index system. Compartment Size: 9w x 12d x 2 1/8h. Desktop/file sorters keep paperwork neatly categorized for follow-up action. Heavyweight dividers are bound book-style so it s easy to open to the desired section. Each section expands to 1-3/8". Accordion fold is tape reinforced. Contains 20 dividers with alphabetic (A-Z) indexing. 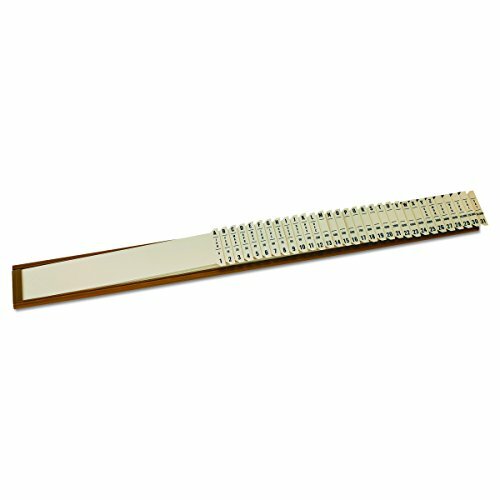 Divider tabs are poly reinforced to withstand heavy use. Holes in dividers help locate papers remaining in file. Includes one letter size (9-7/8" W x 11-3/4" H) desk file/sorter with alphabetic indexing. Proudly made in the USA and is SFI Sourcing Certified. Contains 35% recycled content, 10% post-consumer material (cover) and 10% recycled content, 10% post-consumer material (dividers). Heavyweight dividers are bound book-style so it's easy to open to the desired section. Each section expands to 1-3/8. Accordion fold is tape reinforced. Divider tabs are poly reinforced to withstand heavy use. Holes in dividers help locate papers remaining in file. Proudly made in the USA and is SFI Sourcing Certified. Contains 35% recycled content, 10% post-consumer material (cover) and 10% recycled content, 10% post-consumer material (dividers). Desk Step Sorter keeps files visible and within reach. 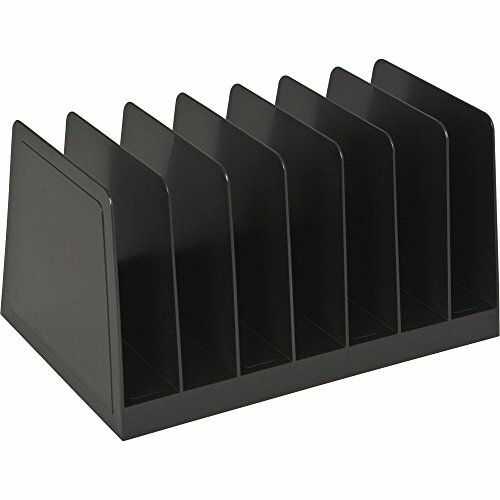 Six inclined slots hold envelopes, invoices, small notepads and more. Sorter is made of durable plastic with recycled content. The Pendaflex PileSmart Project Sorter is a great way to quickly consolidate clutter into organized categories. 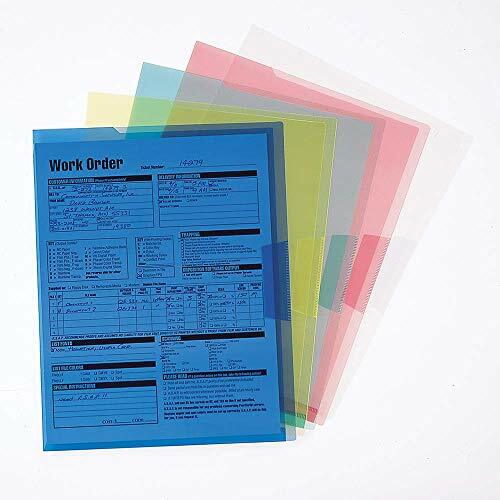 Sort your piles of mail, paperwork and notes with ten color-coded, tabbed poly dividers, then close it all up and secure with a handy elastic cord closure. Label your sections with an index on the front of the sorter two additional index sheets are included. Letter size. Convenient for office, school and home use. Sleek design takes up little room on desktop and adds a pop of color. No installation needed! 1. 12 months Worry-Free Warranty, Carefree Service. CLASSIC DESIGN LETTER ORGANIZER: Metal Mesh Desktop Supplies have a simple and elegant industrial look and sturdy metal construction. Rust resistant with black powder-coated steel. No installation needed! Speed through large sorting tasks with the help of the Pendaflex Plastic Sort-All Sorter. 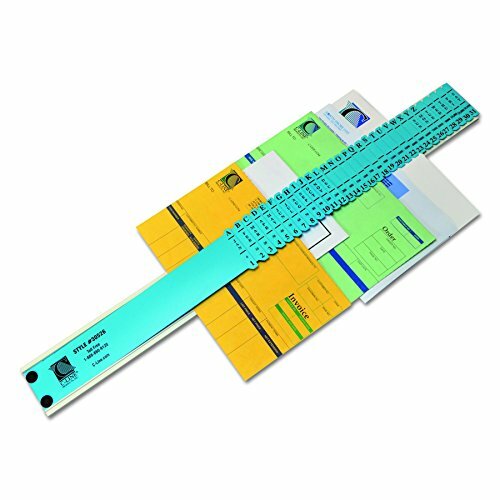 Select from 31 flexible, laminated leaves with preprinted tabs for alphabetic (A Z), monthly (Jan Dec), numeric (0 30,000), daily (0 31), or day of the week (Sun Sat) sorting. Rubber feet prevent sliding on the desktop. Slim and lightweight for easy storage. 2-1/2" x 23-1/4". Space-saving mesh design with stacking file sorter. No Tools Needed. Mesh desktop organizer: Sturdy steel mesh construction with black finish. 5 Stacking File Sorter Section is with five 1.5 compartments. Desk storage, File Folder and Letter Organizer. Stacking Design: Compatible with module DO-008, DO-013 and DO-014 series. 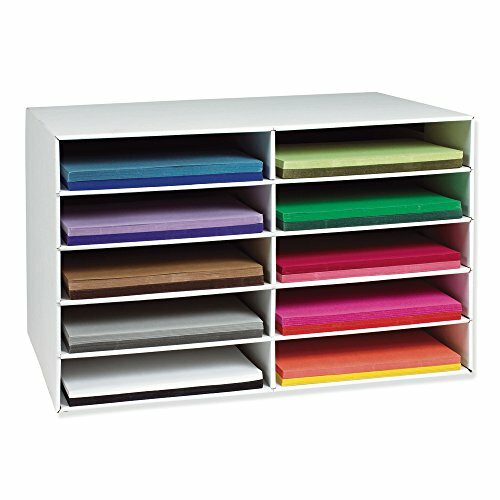 Buy more modules and customize your organizer. Large incline sorter helps organize your work place. Modern open design provides easy access to papers. Perfect for file folders. Eight wide compartments to hold letter and legal size documents and folders. Made from heavy duty wire construction. The incline sorter keeps documents and file folders visible and easy accessible. Protective feet will help limit the scratches on the desktop. Comes in Black. 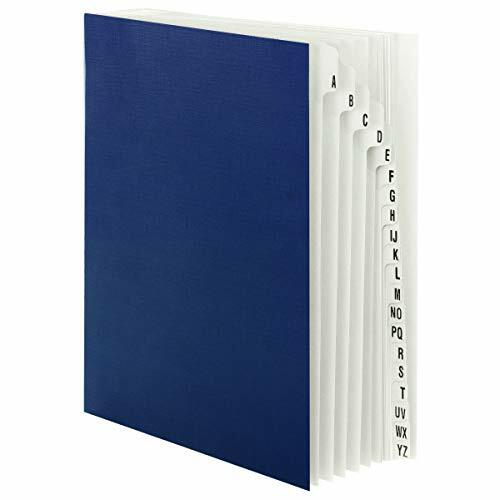 Neatly store 12" x 18" sheets of paper in any classroom. The storage slots measure 3"H x 12-1/4"W x 18-1/4"D. Recycled and recyclable. Keep Organized Easy to sort out and store paper, files, medicines, personal care products, handwork supplies, etc. Keep your place organized and clean effortlessly. Handles for Easy Stacking Design with handles, convenient for you to stack and pile up. Perfect space saver. Perforated Design Elegant and classy sector holes design is nice and concise. These baskets can definitely brighten up your home, office and school. 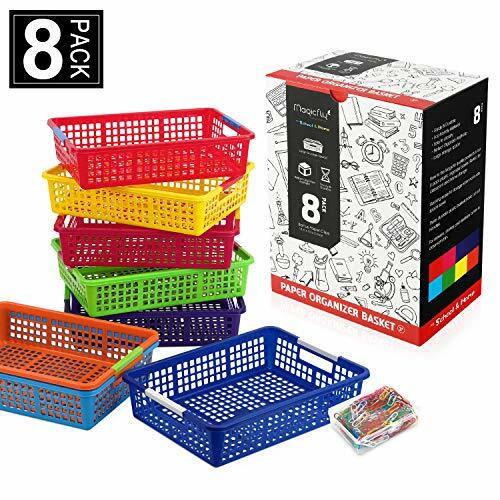 Large Set A set of 8 packs with multiple colors, made of premium plastic, sturdy and colorful paper organizer baskets. More economical to buy a large set! Product Size 13. 5x10x3 inches, suitable for drawers, shelves and desktops in classroom bin and offices. PAG mail sorter is a new design for storing documents and some desktop products flexibly. It has a high-end look. Simple appearance with practical function, make your office or home a new look. 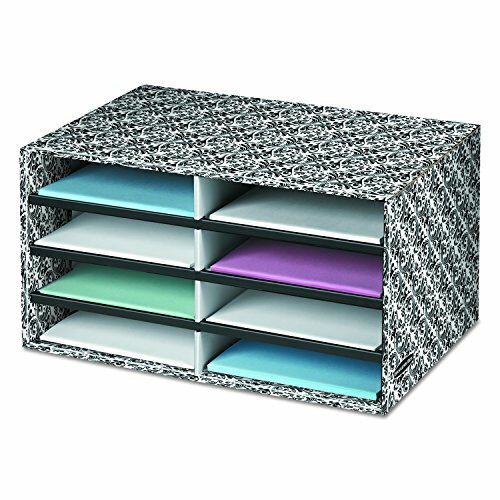 The mail sorter is made of Melamine board with edges protection, includes 3 adjustable drawer boards. Great for storage documents,files,magazines,mails,letters and other letter size paper. What's more, you can use it to storage watches,CD, DVD,picture frames,monitors, laptops, printers, fax machines and other items,very useful and smart design. Curved drawer board makes it quite beautiful and fashion, remove the trouble to your finger when carry documents. Slot design, stable structure, allows you to adjust the space according to the actual situation of use. Come with 4 round sponge pad. Please paste the sponge pad to 4 corners of the bottom board after installation, protect your work surface from scratch and wear. The mail sorter has total 8 combination way, you can use it according your need. 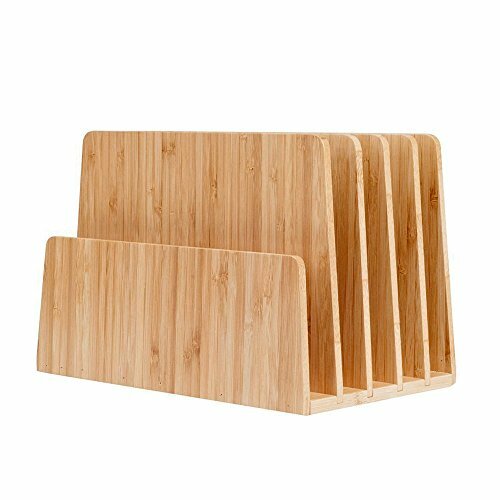 Because strong structure and strong bearing capacity, this wood file organizer is strong enough to put a monitor on top of it and use stackable. All accessories are included. A single man can complete the installation in ten minutes. Wipe clean with a damp cloth. SPACIOUS COMPARTMENTS. 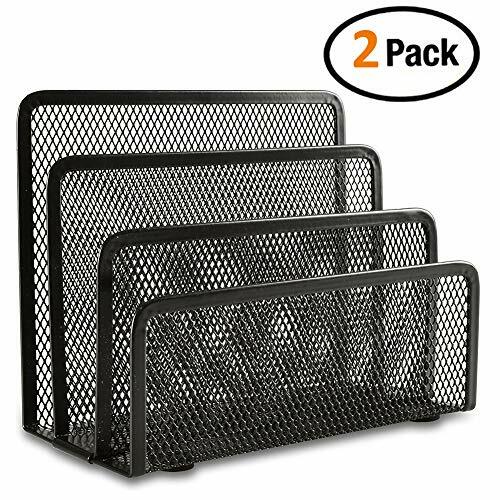 5 vertical desk file organizer sections black wire-mesh incline sorter. Open design compartments file organizer desktop for easy organizing of loose documents, accessories for easy office organization sorting of loose papers, files, notepads, folders, magazines, books, office desk accessories and more. EASILY ACCESSIBLE. 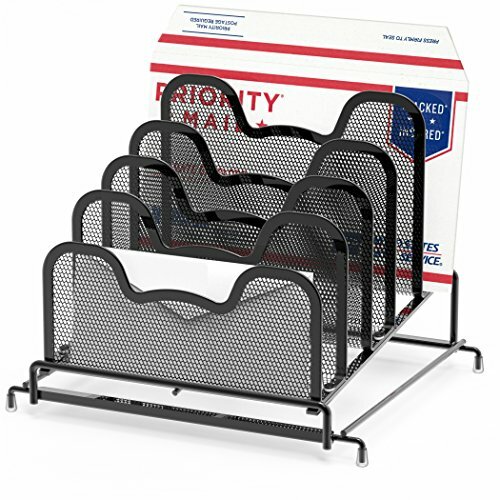 Black mesh desktop organizer file stand holder with tiered mesh file sorter dividers tall enough to keep files upright and visible at a glance, it's perfect for use in your home or office. This desktop sorter file folder organizer will keep files within reach and within view. The organizer for desk sorting blades sit at an angle for maximum visibility and easy file retrieval. Holds files, folders and large envelopes. LOOKS GREAT ON YOUR DESK. Office desk organizer, Smooth desktop file holder ABS coating that feels great to the touch. 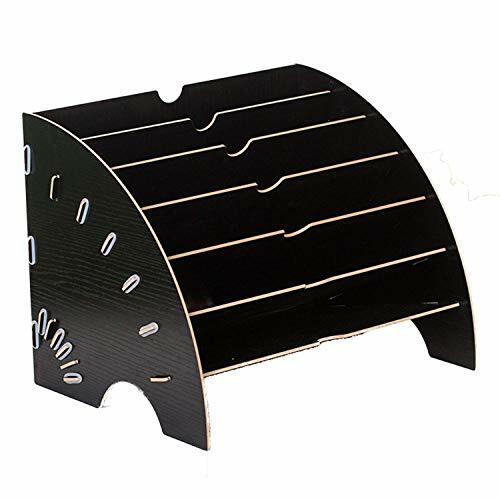 Rounded edges desk paper organizer and trim which blends well with the rest of your office file organizer environment. This desktop file sorter is efficient to use. DURABILITY. Superb Quality Desk Folder Organizer. 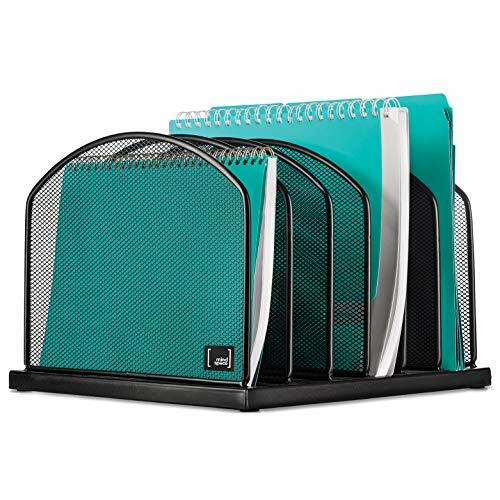 The mesh desktop file folder holder is made of sturdy vertical file organizer mesh metal and a solid metal base that provides support and stability. USE RIGHT OUT OF THE BOX. This Office Supplies file rack organizer desktop, comes fully assembled; just unbox and go. Office Organization Standing File Organizer Dimensions: 11.25W x 7.5D x 11.25H. Register your product for a Lifetime Warranty. Simple solution for a cluttered office: 5-Compartment Desktop File Organizer keeps everything in order. It has 5 compartments to sort all your files and makes them easy to find. Sleek design takes up little room on your desk and adds a pop of color. The metal mesh provides excellent sturdy document storage and smooth tray provides better accessibility. Easy assembly required. 1. 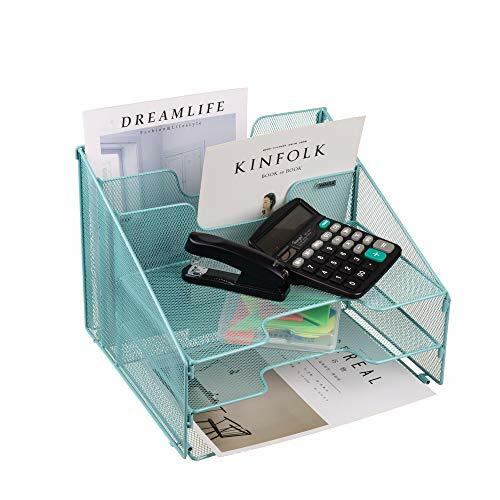 VANRA Desktop File Sorters are made of sturdy metal steel mesh. Best Quality and Unique Design. 3. NOTE: Any Other Sellers are NOT Legal Distributors of VANRA, please do not trust their products. 5-Compartment Desktop File Organizers help to keep your desktop organized and clutter-free with 5 sections tray sorters. 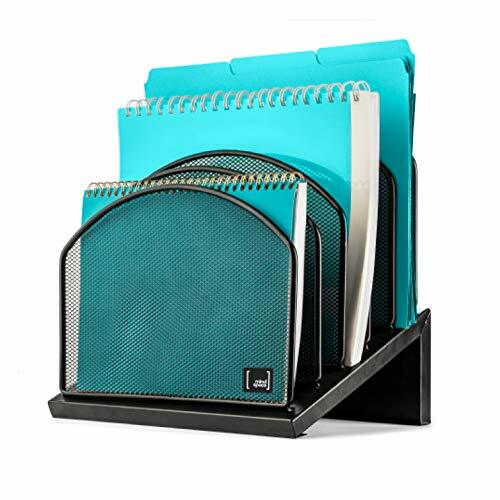 Triple Tray Desk Organiser made of sturdy metal steel mesh with a professional black finish. Easy assembly required for the Space-saving Tray Sorter. Desktop Supply Caddy holds and organizes A4/letter size paper, notepads, books and files folders. Also ideal for keeping pens, pencils, notebooks, highlighters, staplers, sticky notes, binders and other supplies organized and within easy reach. SUFFICIENT SPACE FOR STORAGE. 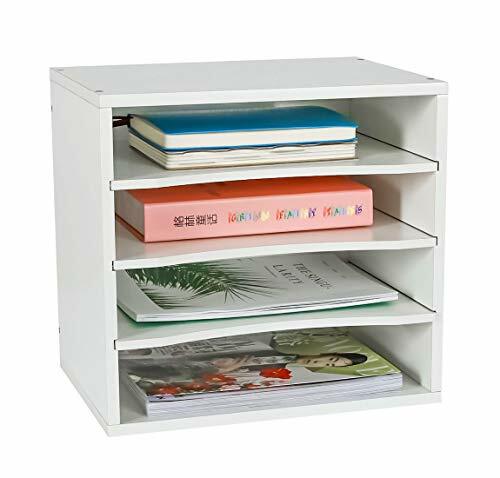 Packed with file organizer desktop 6 compartments of good quality and strength, this Desktop File Organizer Sorter magazine holder is large enough to eliminate worry of document run-off. Keep track of files, folders, and other important papers with this section organizer. VISIBLE AND ACCESSIBLE. Each black wire mesh 5-slot vertical sorter compartment is designed for ease of viewing and quick document selection file holder. With no assembly required for desk organizers and accessories, this horizontal vertical file organizer desktop file folder holder is an ideal tool for fast and simple organization. THE LIGHTWEIGHT HEAVYWEIGHT. The vertical sorter desk file organizer manufactured from high quality material, guarantees durability and consumer satisfaction. Strong metallic base that keeps it from falling off your desk and steel wire mesh metal sorter organizer file sorter sections that's made to last. PERFECT FOR HOME OR OFFICE. 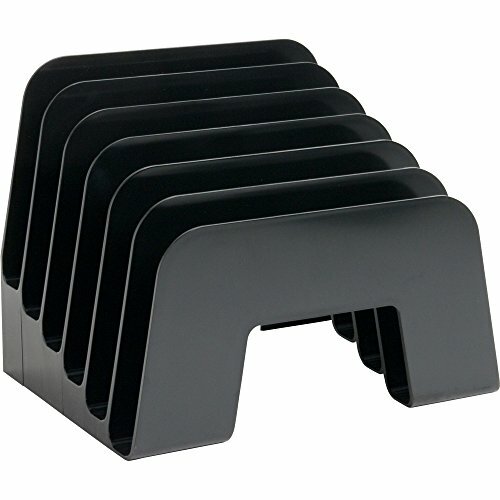 This desk file holder is black in color, so it blends nicely with any home or office decor. 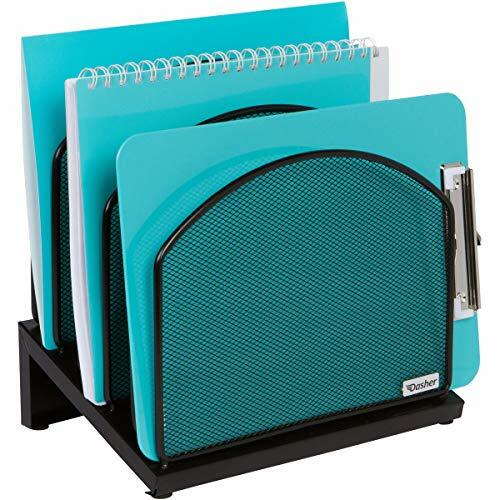 The mesh finish gives it an elegant look and the ABS coating which makes the file holders for desk durable and sturdy, while also maintaining the file sorter organizer color for years. USE RIGHT OUT OF THE BOX. Desk office organizer comes fully assembled; just unbox and go. Dimensions: 11.25W x 12.5L x 8.5H - Register your product for a Lifetime Warranty. Construction Material: Reinforced Engineered ABS Pass Code Type: Manual 4-Digit, Numerical Universal Paper Compatibility: Fits up to Size A4, Letter Paper Small Drawer Height: 2.0 (-Each Drawer) Large Drawer Height: 3.9 (-Single Drawer) Total Cabinet Dimensions (L x W x H): 15.0 x 11.8 x 12.6 SereneLife s SLFCAB20 is the perfect solution to keep your home or workplace organized. This desktop filing cabinet features 4 locking drawers to help you file documents or organize office supplies, tools, crafts and more! Built to last - This desktop organizer hutch with drawers is made from heavy duty ABS plastic with anti-scratch and stain-resistant housing. Sophisticated locking mechanism - The user-defined number pass code setting of the integrated combination lock ensures the privacy and safety of your documents. You also don t have to worry about carrying around heavy locks or keys! Multi-functional - 4-drawer desk box provides ample storage space. Perfect for bills, letters notepads, clips, tape, and office files. Can even serve as paper desk organizer, tool box with drawers, kids craft box organizer, and more! Modern design - Rugged enough for tools and casual enough to keep on your desk in the office. This desk organizer drawers helps you save time in accessing your office supplies and accessories and keeps your workspace in order. This is small enough to fit most counter spaces and features a detachable side compartment for pens and other tall objects and a non-slip rubber base to reduce movement as well as protect your desk furniture from scratches. The desktop drawer organizer compact mini size is an ideal fit for most shelf space or desks. ADJUSTABLE 4 DIGIT LOCK: Office desk organizer with drawers securely file away important documents and bills. Set the 4-digit combo and locking drawers remain secure while the top drawer is shut. 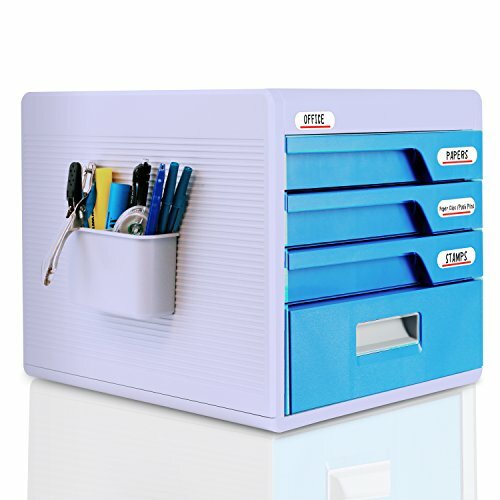 MULTIFUNCTIONAL STORAGE: A great office desk organizer tool box. The 4 drawer cabinet makes desktop organization easy and provides plenty of storage space to help clear up clutter. Use it for filing documents, storing craft paper, notepads and more. STURDY CONSTRUCTION: The heavy-duty ABS plastic housing is durable enough to hold tools and the anti-scratch coating will help keep this desktop drawer organizer looking new in your home or office for years to come. SIDE MOUNTED PENCIL BOX: side mounted on the desktop organizer and provides convenient access to pens and pencils that just never sit still in desk drawers. COMPACT DESIGN: The desktop storage organizer is 15.0'' x 11.8'' x 12.5'' (L x W x H) and small enough to fit most counter spaces. The non-slip rubber base ensures it won't move easily and protects your desk from scratches and scuffs. Desk Step Sorter keeps files visible and within reach. Seven slots hold envelopes, invoices, small notepads and more. Sorter is made of durable plastic with recycled content. DIMENSIONS: 13.4" x 9.4" x 12.2" NO ASSEMBLY REQUIRED - Just pull the desk organizer sorter out of the box an it's ready to use. 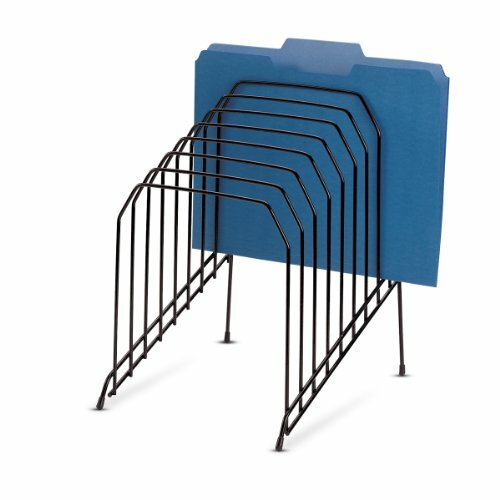 STURDY FILE STAND - Keep your space organized and clutter free. 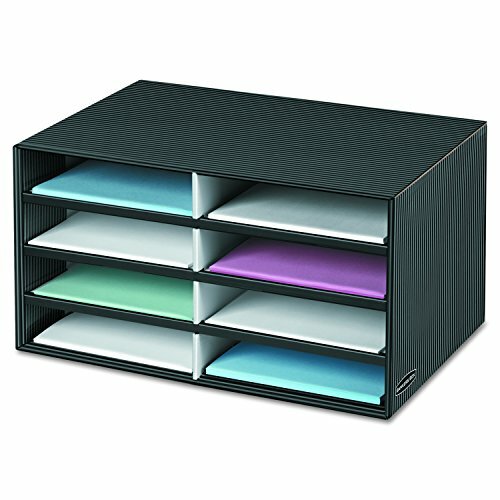 With five vertical sections there is plenty of room to organize your files, binders, folders, and more. NO MORE CLUTTER - Use your home or office space more efficiently by keeping your files organized and off the desk and work space. Wood shelves filing system conserves space while reducing clutter, giving you more space to keep your office supplies, paperwork, textbooks, thick files separate and tidy. Wood sorter sturdy shelf design can hold textbooks, binders, files, loose papers, the unique design of these holder securely holds your reading materials or file. 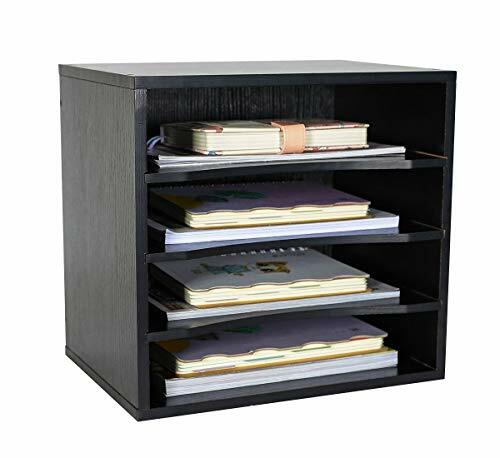 Use your desk space more efficiently by keeping your books categorized and with our 6 compartments to help you stay organized. 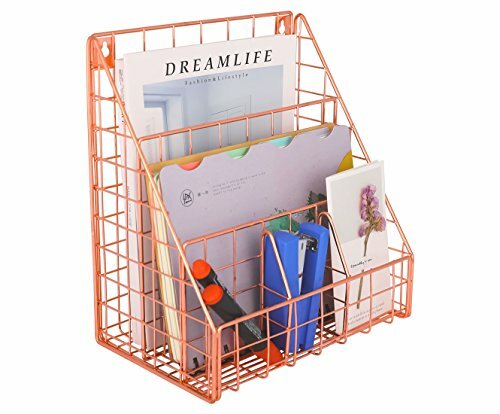 Unique design with smooth finishing to make your office/home desk neat, and the organizer is constructed to make sure you have a beautiful and attractive files tray to satisfy your eyes and work. Wood design make it easy to clean, only need wipe clean with a cloth. See your papers at a glance with Poly project file jackets. Great for transporting files in and out of the Office. Closed on two sides to keep paper and other documents protected and secure. Tuck flap closure for extra security. Durable Poly material is tear proof and water resistant. Includes 10 letter size (9-1/4 W x 11-3/4 H) Poly project jackets. Color assortment includes 2 each of blue, clear, green, red and Yellow. Open wire design with five 2" sections keeps important files, binders and manuals in view and within reach. Wire design will not collect dust. Black. 10 1/4w x 8d x 7 1/2h. Vertical file features an open black wire design with five 2" sections. Do you want your messy desk to be clean and tidy? Are you still having trouble with various files being confused? Don't worry about the office folder assistant to help you! With it, you don't have to worry about it anymore: desks,and computer desks are so messy that you don't have to worry about the files you want to find, and you don't know how to collect them. With it, you no longer have to worry about the bookshelf taking up too much office space! 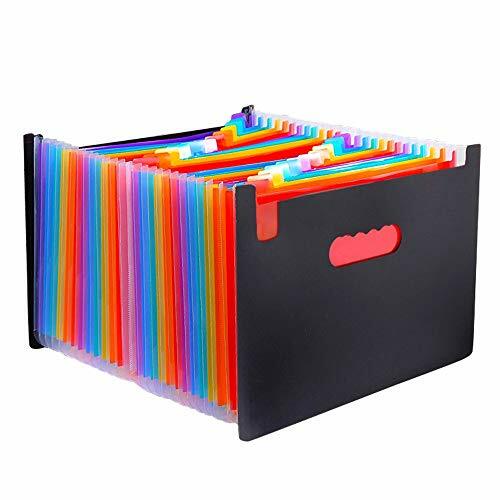 The 24-pocket Accordion Rainbow folder is categorized in 6 different colors and each area is color-coded to help you efficiently sort files and quickly find files! Make your desktop files more organized, making it easy for file storage and file lookup issues! The file box's unique accordion design is flexible and can be expanded according to the number of your files, shrinking to change its own volume without taking up unnecessary desktop office space, shrinking small size (briefcase size) office meeting to carry Convenience! The file shelf has a large expansion space and can hold more than 3,000 pieces of paper. It is your study, desk, desk, database, etc. Indispensable high-efficiency assistant, you deserve it! Large-capacity file box: This file box is used for archiving and storing daily documents. It is suitable for A4 size and Letter size. It has 24 pockets and expandable accordion design. It can be stretched freely and can be lifted up to 68.5cm. It can be used Holds about 3,000 sheets of paper. 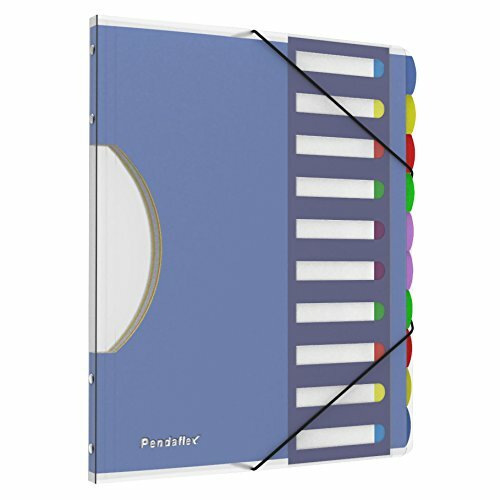 Rainbow folder: 24 pockets are sorted in 6 different colors and each area is equipped with a small color label to help you effectively classify files and quickly find files! Portable Briefcase + Folding Briefcase: The briefcase is 12.6 inches long and the 8.25inch high design is cleverly folded to resemble a briefcase size. It is easy to carry out and has a small footprint at home or in the office. 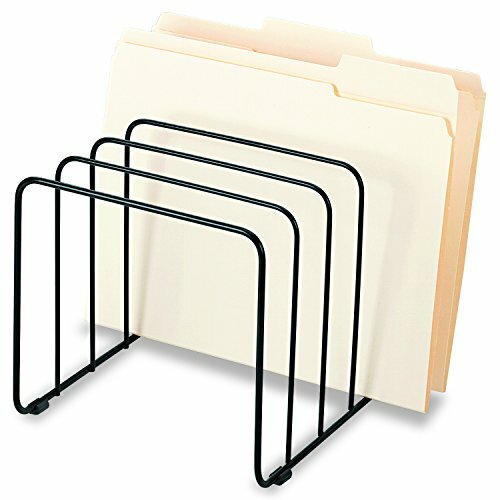 High-quality file shelf: This data rack is made of top-grade 700D polyester and polypropylene (PP). It has no radioactive substances and is safe, non-toxic and non-polluting. The material is strong and wear-resistant, can't be worn and deformed after a long period of use, and has a long service life. Great function. The file box can store various types of documents, such as paper, receipts, business cards, coupons, greeting card envelopes, and the like. Suitable for home, office, school and travel etc. Size: Bottom: 7.87x3.54inches/20x9cm. Height: 5.31inches/13.5cm. Spacing: 1.38inches/3.5cm. With 5 separate vertical compartments allowing you to store all your frequently used files,for quick visibility and fingertip access. 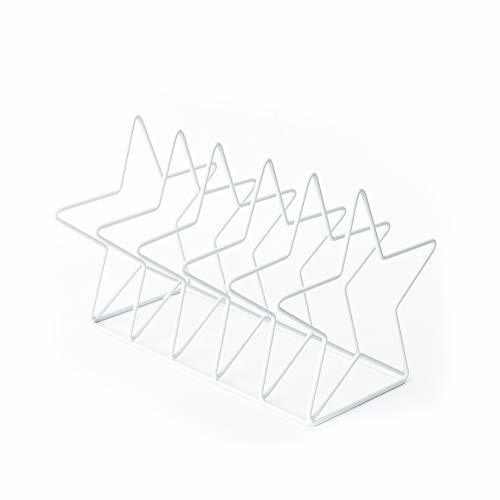 Fashionable desktop decoration,star-shape and smooth metal surface,the perfect organizer to clear clutter from your desk or workspace. 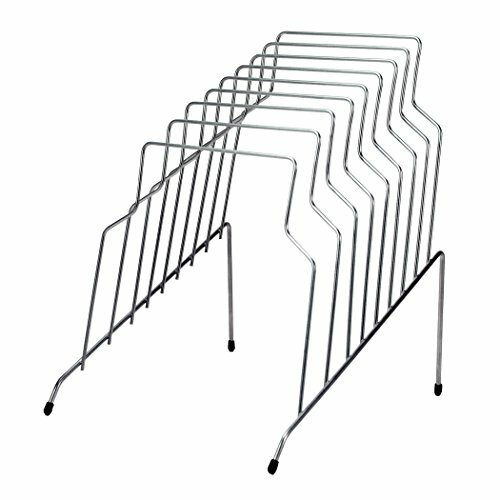 Multi-function organizer rack,great for storing magazine,letter size papers,mails,letters,catalogs and more,there is more room for your desk.